Perfect for your take-out restaurant, cookout, party, gathering, or other catering event, this Visions clear heavy weight plastic knife will exceed your serving needs! Complete your plastic cutlery setting, or use it to fill your flatware bins at your snack shack or concession stand. Made of durable polystyrene, this virtually shatterproof, disposable knife is strong enough to last through your meal service, and can be easily disposed of, making cleanup a breeze. These knives are heavy weight and very durable, we were able to use them for cutting meat and chicken at dinner. They look nice enough for a dinner party but also cheap enough to use for everyday. These are the most sturdy plastic knives I have ever purchased. I usually find decent ones at bulk stores but these exceeded my expectations. They cut well and I have yet to have one break no matter what I eat, Steak, chicken, even a raw potato. I love these! These clear plastic knives are wonderful. They are very sturdy and since they’re clear, go with any decor. They are asked for a lot by my clients. I’d highly recommend. Love the clear plastic as they are neutral for any event or occasion. These worked great for buttering bread, cutting Italian sausage, fruit and veggies on our Italian buffett. Wouldn't hesitate to purchase again! These knives are very strong and do not break when cutting meat! We use them at all of our catering events and weddings! Nice product and very quick shipping! Great knife, they hold up and look fantastic , great price and yearly savings out the roof, Works great for me . Thanks so much for the great products you sell. Great product. No breakage. I've been using these for over a month now and I am pleased. The only drawback is that some of the handle edges are a bit sharp. These plastic knives are study and held up well to cutting through chicken fried steak. They are attractive and a good size, and certainly cut down on cleanup after a large group. Love this product. The knives are a great price for a great quality plastic knife. It is rare to purchase knives without a tendency to break when cutting meats or other solid foods. I will definitely order for my events again. Really sturdy and strong knife. Cuts well and the design fits with any event that we may need to use it at. Can't beat the price either! I was very satisfied and surprised in how good these clear plastic knives were. I'm definitely pleased. I told my friends and family about them too. I think they might start buying them. Perfect plastic knives for any event. Good size and sturdy. I used these knives for a church event. Guests were able to cut chicken, fish and vegetables with knives. I would definitely order again! Most elegant coloration of this set, the clear knife is sleek and light while still being sturdy and reliable. Knife will not bend or break and will not break when dropped. These knives handle cream cheese and cheese balls like melted butter! They are durable and a great match to the visions forks, spoons and soup spoons. The entirenplace setting being available in clear makes a wonderful, flexible presentation no matter the occasion or the color scheme of the plates and napkins. While these aren't the sturdiest knives ever they are definitely worth the price paid for them. Haven't had any customers say they have broken on them, will probably order again. We used these for our wedding as a more eco friendly choice. The plates have a smooth finish and are sturdy enough for bbq! I would highly recommend these for pulled meats but probably not steak or anything too tough. These knives are a good value for the money. We have used these for several events and not had any problems. We will definitely by these again! Very heavy weight knives. This is a good way to get a ton of knives. It is a bit more difficult to count out for smaller events. These are very sturdy and THEY ACTUALLY CUT!!! Our guest had much fun and no one had to worry about flimsy cutlery. They are long enough and feels good in your hand (like you have something there and its not going to bend). Thanks again for a quality product! The Visions Heavy Weight Clear line of forks, spoons, & knives are my go to in a pinch. Clear isn't necessarily my typical "favorite" because attention to details is my thing & usually everything has to match, haha, but for home parties and last minute gatherings/picnics/etc, the clear are my definitely go to. i always have some of each on hand to use in a pinch because they wont clash with any other theme or decor! these knives have survived an outdoor steak meal once and i have not looked back since. They are STRONG and GREAT quality for the price. will purchase as long as they are available! Looking for clear to-go, disposable knives. These heavy weight plastic knives from Vision are a good option. We rated them 4 of 5 because they cannot be recycled, which is very important to our team. We recommend these knives for food trucks and restaurants looking for a good to-go option. Theses are really great disposable knives. They are strong and sturdy and look quite nice. They pair nicely on a buffet or picnic with the Visions Clear Heavy Weight Forks, item 130HFCL100 - PK. Great quality and great price. I ordered the forks, spoons and knives in this set and was very satisfied. All of them hold up well and we used them for a bbq. Very heavy duty and more affordable then buying local. Quick shipping and easy ordering online and I will be buying many more in the future. These did not feel as heavyweight as some other plastic utensils I've tried, but they are plenty sturdy and looked very good at table settings. These knives are nice and sturdy. They are a fantastic price and I will probably have enough to last me for several years. Can't wait to use them at my wedding. What a great deal for these heavy duty plastic knives!! They are a high quality product, packaged in an ideal way--seperate from other utensils so that you only purchase what you need. Perfect size, weight and price! A clear and classic look. This plastic knife is stronger and sharper than you'd think. Its a pretty amazing knife considering the price and the material. The Visions Clear Heavy Weight Plastic Knife is great for picnics or packed for a cold lunch when needed. The quality is good, they work well for being disposable. This is definitely a great value. I really like the heavy weight of these knives. You can actually cut food with them, unlike some other flimsy utensils. Very pretty clear design. More important than a heavy weight fork or spoon is a heavy weight knife! This product fits the bill. I have cut all types of meats with this and no issues! these plastic knives are a great buy. they are very strong so they hold up with even tough foods. this line of plastic ware is a go-to! These knives were high quality for the cost. Great for informal use and everyday disposable cutlery. We used them at a brunch and did not have to cut anything substantial, were great for our purposes. I love the clears, and this one is new different, I'm a new fan of Visions, they're despite their low prices, are a very good brand who actually make good products. These knives are great for my kids cooing classes! They are a great price and product. I use them on a daily basis and they are very durable. These are definitely heavy weight cutlery and are worth the price. Anyone who has used a flimsy plastic knife before will appreciate that these actually cut through meat and tough vegetables. This product served well for our reception following our vow renewal service in May for our reception. The delivery time was superb and will use again. This was an easy purchase. pack of disposable knives are great for just about any event you may need it for. The best part is it's delivered right to your door. The product arrived quickly, packed well, there were no broken items, used for cutting vegetables and tender meats, used for all occasions, would highly recommend. This is a high quality knife that won't break while in use. I ordered in combination with the Visions Clear Heavy Weight Plastic Forks for a fundraising event. I would order again, the quality is evident. The Visions Clear Heavy Weight Plastic Knifes are a staple in our home. They are durable and hold up to all kinds of foods. We find them great when we entertain. They are affordable and do not break. I would recommend them. I love the price and the quantity. Yeah really, 100 for this low price. I used it as well for my personal use and it can even cut meat when eating. I always struggle finding the line between affordable and durable plasticware, and this hit the mark. The knives are sufficiently sharp, and the price was excellent for the quantity and quality. great strong knives for a great price. The packaging they come in is horrible, so I suggest removing them and putting them into a cutlery bin or holder. But the knives itself are great. Used the Visions Clear Heavy Weight Plastic Knife to cut a zucchini. Ths was a raw zucchini and it sliced right though it very easily. First time ordering for paper goods, great pricing and good product. Webstaurant is now my go to place for supplies. Easy ordering, fast delivery. Thank you ! High quality plastic knives. These are extremely durable and stand up to any kind of use. Excellent price to have quality plastic tableware instead of the flimsy ones that break. 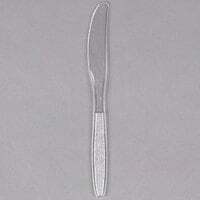 This was the type of Knife that we were looking for our functions and every day usage at our church. It is strong and seems as it will hold up well. Quality product. The clear color is nice if you are concerned about trying to match certain place settings or decor. Very sturdy makes them a great deal. I was very pleased with these knives. They are very sturdy. The great price was great. Definitely have been telling friends and family about my purchase. I think these are great plastic knives. I've bought light and medium weight ones in the past, but they're so flimsy that they're almost worthless. These work very well and are very cheap. Very nice, durable utensil. These are very elegant for formal events, yet super easy for clean up since they are disposable. Also at an excellent price! I would beg to differ with at least one review on this product. It is very heavy duty, but it's cutting ability does not compare to the plastic knives of similar quality found in the wholesale clubs. Looks and feels of quality, just not for cutting through anything more than cooked pasta or the likes. The knife is very sturdy and cuts well. We love it for our dessert crepes! They also look nice. We are very pleased with these knives and will continue to use them! Customers love how sturdy these knives are and how sharp they are too. Most of ours are used for bagels to go and they do a great job! These knives are a great value! They're super sturdy and they cut well (even meat)! We really like the clear color. We'd recommend this product. Our Sunday luncheons often include bread to be buttered, meat to be sliced on one's plate or pie to be cut. These Visions knives are our favorite! This is great quality plastic wear.Holds up nicely does not break when you cut things. It is also good looking and does not look cheap. If you want a product that works for a variety of occasions, please look no further. This product worked well for cutting food and is a great length. Well worth the price.